“They should have either warned Cheryl and people like her of the potential dangers”. 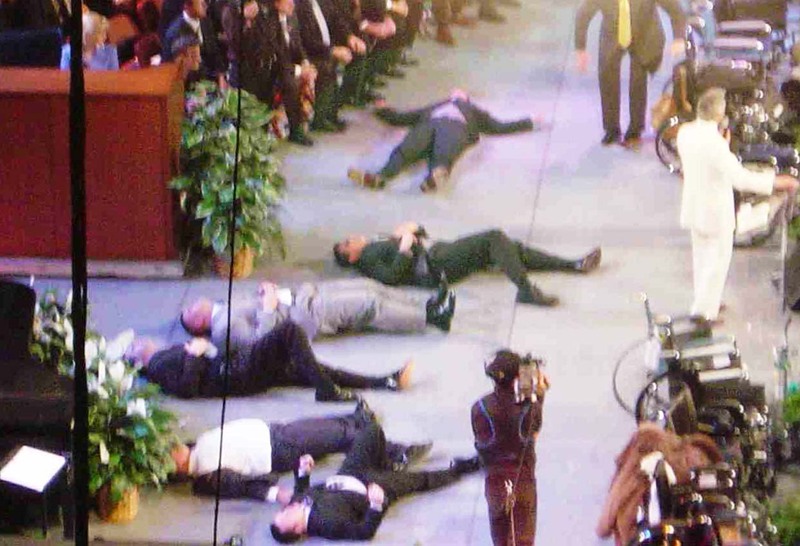 The floor of Evangelical Churches is not suppose to look like a war zone, where people get injurded by their pastors. Cheryl Jones alleges in a complaint filed in December that she was visiting the church when member of the congregation received the “spirit” during praise and worship and with no ushers or members to assist, the parishioner fell backwards knocking several members into the plaintiff, who was injured falling to the floor. “They should have either warned Cheryl and people like her of the potential dangers -especially if they’re not going to have deacons or parishioners to help these people when they fall,” attorney for the plaintiff Brian Millikan told ABCNews.com. Because falling during the service, according to Millikan, is something that “seems to happen often” at the church. The devil is sometimes in the details. If you read the Bible, you will not find a single person who has blessed by the Holy Spirit, by being pushed backwards. All the people who were touched by the Holy Ghost and worshiped Jesus, feel forward. The positive effect by falling forwards, is that most of us face the ground after having the possibility of using our arms as shock absorbers. We can also bend out knees. The problem cause by pushing people to fall backwards, is plenty. Not only can we break our own neck. We can also fall over chairs and tables, and even brake the leg of innocent people behind us. There is no Biblical defense for the practice of being “slained in the spirit’. Therefor is is suitable for Churches who practice this false Word of faith doctrine, to be sued for damages. Many Pastors do not mind that their Churches is moves into spiritual bankruptcy. But when they go bust also financially, it might lead them into some kind repentance, and willingness to obey the World of God. Some absolutely good information, of falling backward and forward, by the Holy Spirit or by false word and false doctrine. God bless you Ivar, keep-up…………. In scripture, and please correct me if I’m wrong; when people fell on their faces, isn’t it because either an angel, or the very presence of G’d has appeared to them? I don’t recall any instance where people were “slaine in the Spirit,” just for the entertainment of those who were present. What is the perpose of these acts? And if it is a divine visitation, why is it not followed by a divine prophecy? I think that these are acts of hysteria, and possibably demonic manifestations, because they are turrning worship services into sideshows. I’m not saying that I don’t believe in miracles, because I do; I’m just scepticle because these manifestations seem to happen on demand. I believe that the manifestation of the Spirit is a very rare and awesome event. There will only be two flocks in front of Jesus. A large that have become Universal and corrupt, and those few who have obeyed the teaching of the Messiah. The majority have chosen the broad path that leads to eternal punishment and destruction. The minority have chosen to stay put despite severe persecution. Jesus said: – Let the dead go and bury their own dead. He was talking about the walking dead around us. [ Fear the LORD ] And now, Israel, what does the LORD your God ask of you but to fear the LORD your God, to walk in obedience to him, to love him, to serve the LORD your God with all your heart and with all your soul. I don’t know why I feel compeld to share this with you, perhaps, because it’s the closest that I’ve come to seeing people moved by the Spirit. Some years ago I was blessed to live close to a messianic synagogue. This Temple was also very near to a small, mostly jewish, nursing home. These patients saw the star of David on the sign outside and knew that it was a synagogue. Many of them didn’t realize, nor did they care, that it was a messianic temple. If they could walk just a few steps down the street, they could attend. After our friday evenings shabbat service, there would always be plenty of kosher food available. Our rabbi was a soft spoken man, with a zeal for the Lord. Needless to say, many in his little flock were both physically and mentally impaired. However, he would take the time to personally talk with each one of them. Quite often they would cover their heads with their prayer shawls and spontainously dance, others would at times, begin talking to no one in particular, or they would sing, often while rabbi was talking. They would worship the lord like little children, it was amazing. The love, tenderness, and the respect that this rabbi had for his little flock of; what the world would view, as misfits, was a true work of the Lord. I don’t believe that I’ve thanked the Lord as often as I should have, for allowing me to expeirence this work of his. It was a true blessing. Yes me and.my. (2) sons went a church in Atlanta, Ga and their was a lady who prayed for us and after praying and blowing on me and rubbing my stomach, and my fotehead and when the Holy Spirit did come upon me the Evangelist pushed me on the floor and.i feel backwards on my arm where my left fore-arm have.been in pain and it had swollen up yesterday June 30, 2013 and i have taken some strong pain medication call tramadol and now.its another.day and my body is sore but my fore-arm hurts the worst. Can the Evangelist be libel for these actions? Sue the Holy Spirit……….Just kidding. Call the bluff, and inform the pastor. Give him a chance to repent, and even gift you some compensation.